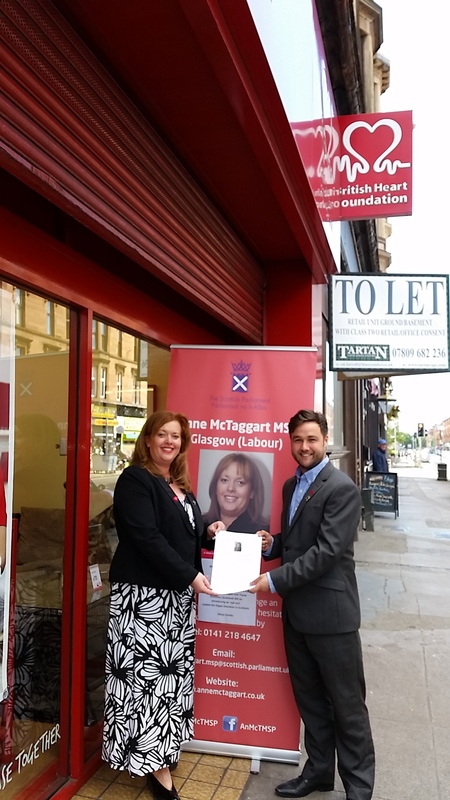 Glasgow Labour MSP Anne McTaggart yesterday visited a British Heart Foundation (BHF) store in Dumbarton Road, Partick, to speak with shoppers about their views on her proposed Scottish Parliament Bill which would introduce an opt-out system of organ donation in Scotland. This was the first of many public events Ms McTaggart will hold across Scotland as part of the 13 week consultation process, which aims to provide a range of views on the subject matter of the proposed Bill: highlighting potential problems, identifying equalities issues, suggesting improvements, considering financial implications and, in general, assisting in ensuring that the resulting legislation is fit for purpose. Ms McTaggart was joined by David McColgan, Policy Manager at BHF Scotland, one of a number of charities who are supporting Ms. McTaggart’s Bill. Ms McTaggart said “I was delighted to be able to meet with local people in Partick, and with the amazing staff and volunteers in the BHF store, to discuss the important issue of organ donation. The response was overwhelmingly positive in favour of introducing an opt-out system. “Despite major national campaigns and a national strategy, over half of the population is not registered as a donor and last year 38 people died in Scotland because of a lack of available organs. We simply cannot wait any longer for change. Ms McTaggart was interviewed on her visit by STV Glasgow, which you can view here. The consultation survey can be completed here.